MONTHS HAVE PASSED since I wrote last in this blog. Today I’m writing two at once, for reasons that will make sense as you read on. This post is a companion piece to Pictures Have Stories: Elven Lords (and I apologize for any repetitiveness you find between the two). My silence hasn’t been for lack of a desire to talk with you, but from an iron determination to put all my effort into mission-critical work. Right now, that work is to finish my part of the Deluxe Tunnels & Trolls project. Backers privy to the private Kickstarter updates have read about both our progress and pitfalls. With T&T as my sole focus, I stopped doing any other freelance work. To keep the wolves from my door, I’ve been selling existing art, original paintings and inkwork alike. This year is the 20th anniversary of Magic the Gathering, bringing many collectors and fans to my door. Moreover, the incredible The Gathering book (also Kickstarted last year) has been released, showing off one of my newest paintings. (I wrote about how excited I was to be starting to work on it in October 2012.) 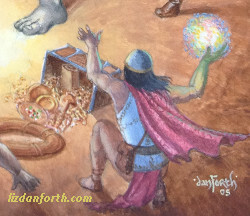 Other collectors have been picking up art done for Middle Earth, the few pieces I did for AD&D, and even some card paintings for Doomtown and L5R. 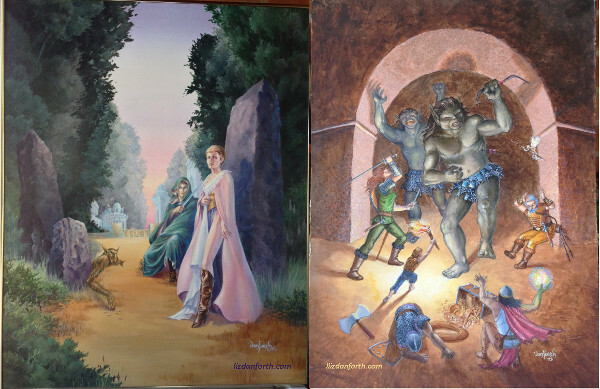 These two blog posts will talk about some iconic paintings associated with Tunnels & Trolls that I am offering for sale. People seem to enjoy hearing about how “Pictures Have Stories” so each post will tell you about one of the paintings. 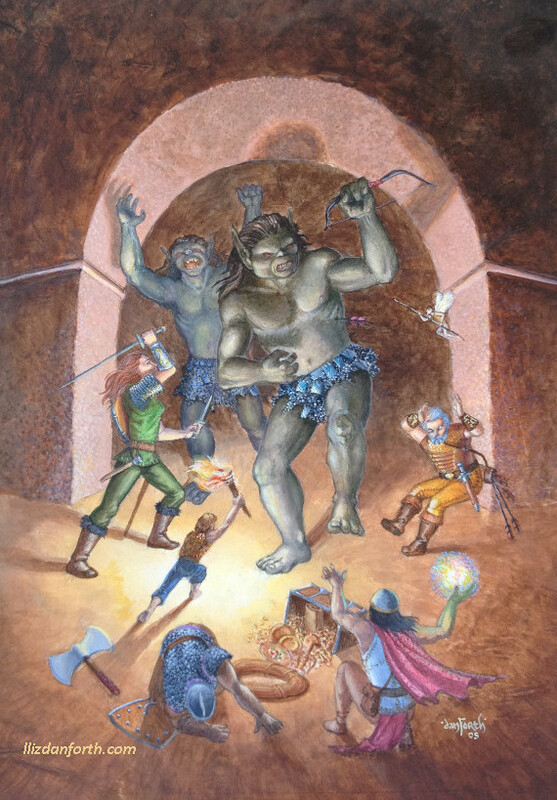 This post will be about the 7th edition cover of Tunnels & Trolls, a painting I call Two Seconds Later. In the other post, I talk about the tale of Elven Lords. Here’s a look at both. (Once both links are live, you can click this picture to go directly to the other post — and from there, you can click it to come here!) There will be larger versions of both paintings to look at more closely, so follow me over the jump. For those of you who might not be familiar with the painting (not everyone who reads my blog comes here because of T&T! 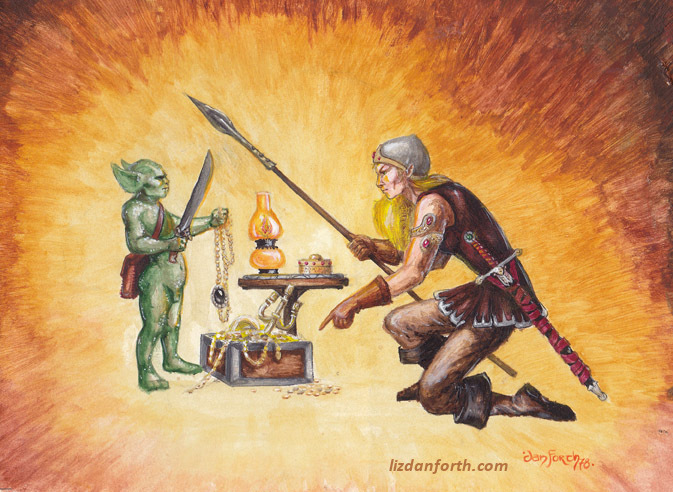 ), here is the previous cover he was referring to, the one I painted for T&T Fifth Edition back in 1979. 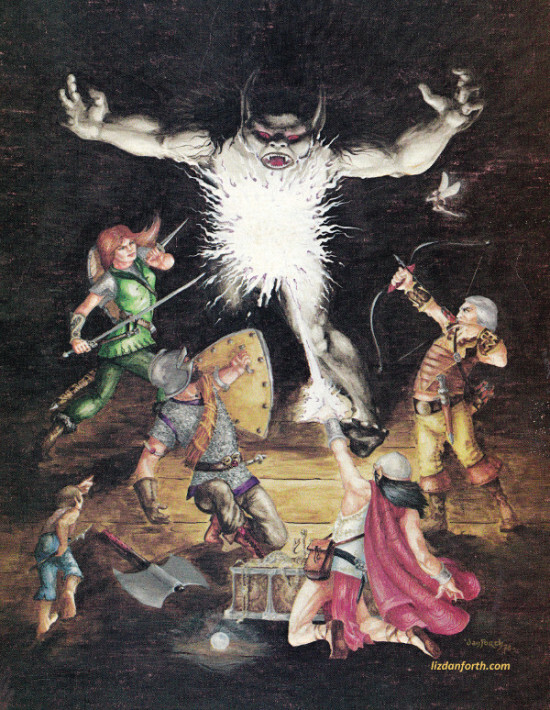 Adventurers in pitched combat against a troll charging out of the darkness… warrior and wizard, male and female, archer and axe-weilder, human and elf and dwarf and hobb and a wee fairy… and a chest of treasure to reward the victors. All the elements of the T&T games I played with my friends, brought together in one picture! It all seems so obvious now… yet it some ways, it wasn’t. Let’s start with the fact that I didn’t even have a clear vision of what I thought a troll should look like. I had a zillion fuzzy impressions from illustrated fairy tales, but all those merged with giants, orgres and all manner of badass monsters of indeterminate type. In terms of our game, I knew they were supposed to be big humanoids, mean, and dangerous. But… big nose or little? Two fingers or five? Big ears or none? Hairy or bald? Skin color should be what, exactly? Clothing or naked? Armor, weapons? I had no idea. The state of “not-knowing” is something any creative person is familiar with — some suggest it is the very wellspring of creativity, and I agree. I often speak of “finding my images in the paper” as I go along, and I thrill when I discover challenges and surprises, dancing with the unforeseen and unexpected. I’m mostly a self-trained artist, and the acrylics scared me. I’d used oils a few times (with varying success) but most of my previous color work was done with gouache, the favored medium of the old pulp magazine cover illustrators. To get my metaphorical feet wet, I decided to do a vignette, a trial piece with some of the same elements and the same feel. This little painting resulted, and I called it Divvy Up the Loot. While goblins and humans might not often go adventuring together back in days gone by, it gave me a chance to paint a non-human character, and to experiment with the metallic paints. (Along with all the other things I didn’t know back then was how to make painted metal look like metal. My inept solution? Buy paint that looked metallic! It was the best answer I could come up with, at the time. You have to realize I was still pretty young and very inexperienced.) You’ll notice a complete lack of background, as I focused just on the characters and objects around them. I sold the painting a few months later at the TusCon science fiction convention, to a longtime friend and fan Daniel. He’s the one who has kindly loaned me the painting back, to be shot for this blog post. (He also dug up an early T&T calendar, which enabled Steve to resurrect a lot of “lost” Rob Carver art for the new edition.) This little painting will appear in the Deluxe T&T edition, in the color pages, but at the time it taught me just enough to gird my loins and move on. I took a deep breath and plunged into the big painting. You know how that turned out. I hadn’t learned anything more about backgrounds and perspective, and although I hoped something would suggest itself, it didn’t. In the end, I just filled in the dark background to suggest the lightless tunnels. While the goblin looked fine as a green-skinned little runt, I elected to make the troll a rockier slate-grey (or at least, that was the idea). The flash of exploding magic left the big guy’s state of undress up to the viewer’s imagination too. I see many flaws in the painting now, both in composition and execution, but I was proud of it at the time. Rick Loomis bought the original and it hangs in the FBInc offices today. Then, I got a another chance at the scene. Well, that was the idea behind doing the same scene as it might appear “a few seconds later.” I went into the work with much more confidence, after years of doing Magic cards and other paintings large and small. It was amusing to revisit the same characters, to see the first troll accompanied by another, and to bring a little more understanding of light and anatomy to the painting. I had learned to “blend” acrylics in the interim, and now I understood how to paint metal, so didn’t have to rely on bizarre pigments. I wish I could say I was equally proud of this version of the cover. I’m not DISpleased by it, but I wish it had turned out better. The painting was done at a very difficult time of my life. My mother had passed away not long ago, and I had been her caregiver through some trying years. Within months of her death, my ex and I had split up after two and a half decades as a couple. Marketing wonks say “Never apologize” and “never talk about what you’re not.” For good or ill, I believe in being straight up about myself and my work, honest about both the good and the bad. For the T&T 7e cover, I expected more of myself. Judging by comments I’ve seen in online forums, I’m not alone in that… although a lot of people seem to like it anyway. It was genuinely as good as I could do just then. If you are one of those people who does like this piece, or values the place it holds in the progression of T&T cover art, this is your chance to own this painting. I’m going to do a “best offer” auction. If you want to bid on this painting, send me a private email to etdanforth @ gmail.com (no spaces) and make your best offer. I will accept offers for at least two weeks (through Monday May 12th, midnight MST) or until bidding stops. In the Comments section to this post, I will keep everyone informed about the current high bid. You can adjust your offer or decide to pass. The painting will go to whomever has offered the best price when I declare the end of the auction. The painting is unframed, 14 x 20 inches (appx 35 x 51 cm). It is acrylic on paper affixed to 100# Strathmore illustration board. There are NO publication or reproduction rights attached; all rights are reserved. (That is true for all the art on this website.) The piece was completed in March 2005, while I was living in Scottsdale Arizona. I will ask you pay shipping, insurance, and any other added consideration/services you want. If you are in the US, I’ll recommend you use Amazon Payments, if you will. (I’ll even give you a discount on shipping if you do so.) I can also take PayPal, Square Cash, or I can bill your credit card with Square. In the interest of full disclosure: I am allowing Kickstarter backers a small bonus to their bids, as a thank you for helping bring T&T back. (I will check with Rick to confirm, so please use the same email.) The person who purchases either of these paintings helps me continue to focus on completing my part of the Deluxe T&T project. I am asking for a minimum starting price of $500. This is about half the price of any other full-sized painting I’ve sold, and would be pretty low even for non-Magic card-art paintings that are 1/10th the size of this one! 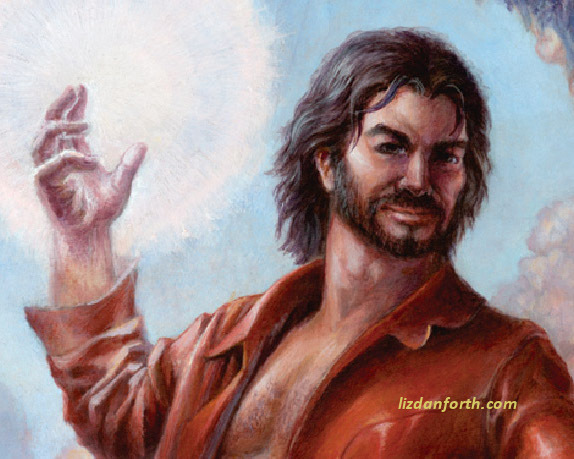 (Magic card paintings are even pricier.) The person who purchases either of these paintings helps me continue to focus on completing my part of the Deluxe T&T project. If you have questions or comments about Two Seconds Later, feel free to ask those publically in the Comments here or privately. Again, my email address is etdanforth @ gmail.com (without the spaces). As always, thank you for your interest in my work, and best of luck! Click here to go to the other post. This entry was posted on Monday, April 28th, 2014 at 12:04 pm	and is filed under An Offer, Art, Creativity, Freelancing, History, Musings. You can follow any responses to this entry through the RSS 2.0 feed. Both comments and pings are currently closed. I do love your ‘Pictures Have Stories’ and I’m *so* glad that ‘Divvy Up the Loot’ will be making an appearance in dT&T. It’s a new piece to me and it’s lovely! Always great to hear about how the art got made and to actually SEE a previously unseen painting by Liz! Great post and good luck with the auction! First bid is already in at $511. Thank you! I think I vaguely understand where you were coming from with ‘divvy up the loot’, since I’ve done similar things with writing (though only at a very amateur level). I stare at a scene I’m ‘supposed’ to be writing blankly and don’t have a clue what to do; so I go off and write something trying to get inside what some of the characters involved are thinking, or a piece of other background material. I found it nice to discover another blog post had been made here; the prolonged absence of updates was something I was wondering about. Writing a secondary piece to develop one’s thinking about the primary project…. I think there’s a long and treasured history of doing such things! Certainly I know I’ve done similar things in my own writing. Interesting that you make the parallel about the artwork … and yes, I agree they have a similar raison d’etre.